The Mumm Walk cocktail pays tribute to the first moon landing and the flavours of the Milky Way. To celebrate the revolutionary launch of Mumm Grand Cordon Stellar, Maison Mumm has joined forces with former Senior Bartender from the Savoy in London, Martin Hudak, to create a cocktail that is truly out of this world. 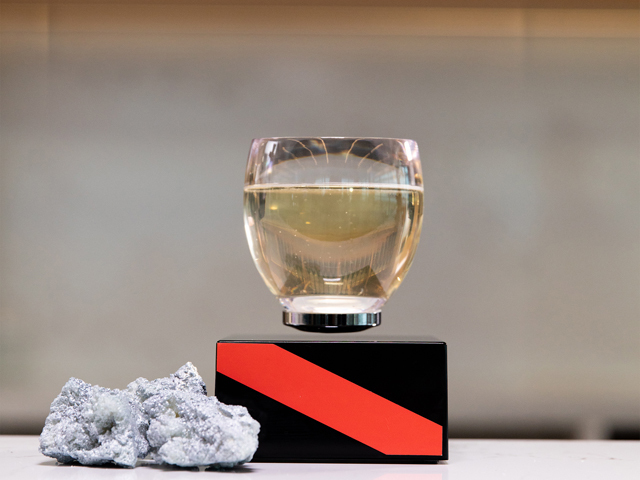 Lifting off in September, Mumm Grand Cordon Stellar is the first champagne bottle designed for space travel, making it possible for astronauts and other space travelers to enjoy champagne in the challenging surroundings of zero gravity. The revolutionary new bottle and glass concept will transform life in space, making a high-tech champagne ritual available to all in the very near future. To provide a way for earth-bound patrons to celebrate this moment in history, Martin has created 'The Mumm Walk' cocktail, which draws inspiration from the famous 'Moon Walk' cocktail – the first beverage consumed by astronauts after the moon landing in 1969. The Mumm Walk combines Mumm's latest cuvée, Mumm Grand Cordon, Havana 3yo rum, strawberry gum, vanilla syrup, grape juice and clarified milk to create a deliciously silky cocktail. Martin explains, "Mumm is known for pushing the limits, and the launch of Mumm Grand Cordon Stellar calls for an equally innovative cocktail to celebrate the moment. The Mumm Walk brings together sweet berry and vanilla flavours, which is a replica of what the Milky Way is said to smell and taste like, according to astronomers. Scientists have discovered a dust cloud at the centre of the Milky Way which holds the molecule ethyl formate – the chemical that gives fruit, wine and flowers their sweet scent, and raspberries their wonderful flavour." "So, for this world first, it not only made sense to pay tribute to the first moon landing and the famous Moon Walk cocktail, but also create a beverage that actually tastes and smells like the galaxy above us." Maison Mumm is the Official Champagne of the Melbourne Cup Carnival, and The Mumm Walk cocktail is the perfect beverage to serve at Cup Day parties around the country. Below is a simpler, yet still delicious version of The Mumm Walk cocktail that party goers can create at home.